January 28, 1719: According to the log of HMS Pearl, whose sailors played a critical role in the November sea battle that killed Edward Thach near Ocracoke, N.C., two of the condemned pirates were taken from the ship and hanged on the Hampton, Virginia waterfront on this day. http://nautilusproductions.com/projects/queen-annes-revenge. Representative image. "One Cannon coming up!" 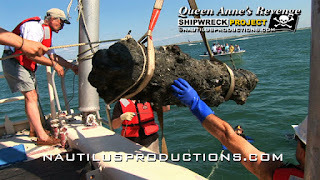 One of Blackbeard's guns surfaces nearly 300 years later on the Queen Anne's Revenge - Blackbeard Shipwreck Project. From the Nautilus Productions stock footage library. Watch the video! "Such a day, rum all out. Our company somewhat sober; a damned confusion among us! Rogues a plotting." - Edward "Blackbeard" Teach. 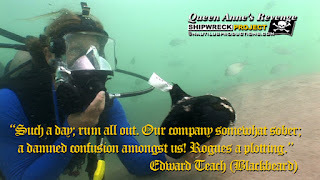 One of Blackbeard's 300 year old onion bottles appears out of the sand on the Queen Anne's Revenge - Blackbeard Shipwreck Project. From the Nautilus Productions stock footage library. Watch the video! Blackbeard's Head On Display! January 3, 1719: Lt. Robert Maynard returns to Hampton River, VA with Blackbeard’s head hanging from his bowsprit. 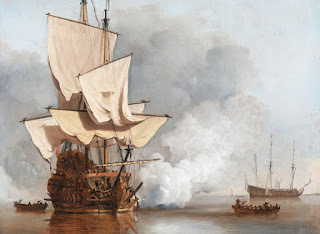 The notorious pirate had been killed during a spirited battle near Ocracoke, North Carolina. Cannons roared and townspeople cheered when they saw the horrific trophy sailing up the river toward the King Street docks. 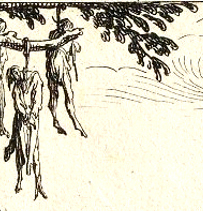 According to tradition, the head is placed on a pike in the water, at the site now known as Blackbeard’s Point at the entrance to Hampton Creek (now Hampton River, Virginia). http://nautilusproductions.com/projects/queen-annes-revenge.